Home news US-backed forces captured Islamic State’s self-proclaimed capital. US-backed forces captured Islamic State’s self-proclaimed capital. Syria Direct, after a months-long campaign of bloody urban warfare and dense bombardment in the desert provincial capital. The final battle between Islamic State (IS) fighters holed up in Raqqa city and the US-supported SDF occurred on Tuesday at a sports stadium—reportedly used by IS to hold a number of civilians captive—in one of the city’s central districts. 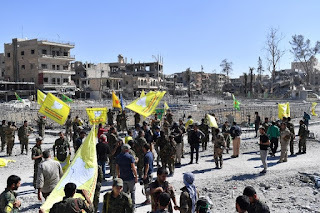 As of Tuesday afternoon local time, SDF fighters were conducting a final search for any possible IS sleeper cells remaining in the city and clearing landmines from the latest districts seized by the US-backed forces, said Silo. “The liberation of Raqqa will be announced within hours,” Mustafa Bali, a SDF spokesman told Syria Direct on Tuesday. The Syrian Democratic Forces—a multi-ethnic coalition comprised primarily of Kurdish and Arab fighters—launched the battle for Raqqa city on June 6, Syria Direct reported at the time, as part of the Euphrates Wrath campaign to take control of the Islamic State’s self-proclaimed capital. SDF forces—with the support of mostly American aircraft and ground forces—steadily advanced from the eastern and western fronts, then proceeded to encircle IS militants inside Raqqa through an advance south of the city. Once the US-backed Kurdish majority forces penetrated the inner districts in early July, they faced a fighting force that had entrenched itself in the provincial capital since the Islamic State captured Raqqa city in 2014. SDF fighters clashed with Islamic State forces building by building while the US-led coalition launched thousands of artillery rounds and airstrikes on IS-held neighborhoods. Since the opening of the Raqqa battle on June 6, primarily American airstrikes and artillery bombardment claimed the lives of more than 1,000 civilians, according to a September 20 assessment by the Britain-based monitoring group Airwars. Airstrikes and bombardment in support of the Syrian Democratic Forces also flattened full neighborhoods of Raqqa city, with more than half of the provincial capital’s districts suffering “extensive” damage, according to a report released last month by REACH, a UN-affiliated research and relief organization based in Geneva. But American-backed airstrikes on the provincial capital slowed to a halt as the SDF began the “final stage” of the battle for the desert provincial capital, cornering IS fighters into roughly 2 sq. km within the city’s central districts. The US entity Operation Inherent Resolve, which publishes daily summaries of coalition airstrikes in Syria and Iraq, has not reported any airstrikes on the city over the past three days. On Sunday, an estimated 275 Syrian Islamic State fighters and their family members were evacuated from Raqqa to an undisclosed location as part of an agreement coordinated by Arab tribal elders and the Raqqa Civil Council, a local, SDF-affiliated governing body, according to an SDF statement published the same day. Sunday’s evacuations left only a few hundred, primarily foreign, Islamic State fighters in the city, centered around the National Hospital and the sports arena in the provincial capital’s central districts. Islamic State-affiliated media outlets have not yet reported the loss of the city. An estimated 5,000 to 8,000 civilians still remained in Raqqa as of late September, according to estimates of relief organization REACH. It was not immediately clear how many civilians were in the final IS-held districts of Raqqa city on Tuesday. The SDF capture of Raqqa city on Tuesday means that the tens of thousands of displaced residents, many of them living in other Kurdish-held areas of the province, can return to the city in the coming weeks. But the four-month campaign to topple the Islamic State’s self-proclaimed capital has left the city in ruins—entire neighborhoods flattened, electricity grids offline, water lines demolished and rubble piled in the streets.